U.S. Secretary of State Rex Tillerson will travel to Asia on his first trip to the region as the top U.S. diplomat. U.S. Secretary of State Rex Tillerson will travel to Asia this week on his first trip to the region since his confirmation as U.S. President Donald J. Trump’s top diplomat. Tillerson will begin his tour with a visit to Japan on Wednesday, March 15, then move on to Seoul on March 17, and end his trip in Beijing on March 18. Tillerson will meet his counterparts and other senior leaders in all three countries. In Japan, he is expected to meet with Minister of Foreign Affairs Fumio Kishida and Prime Minister Shinzo Abe. In South Korea, he will meet his counterpart Yun Byung-se and acting President Hwang Kyo-ahn. In Beijing, Tillerson will meet Chinese Minister of Foreign Affairs Wang Yi, State Councilor Yang Jiechi, President Xi Jinping, and Premier Li Keqiang. Regarding the Japan leg of the trip, Thornton, who will travel with Tillerson, clarified that the trip would build “on Prime Minister Abe’s summit meeting with President Trump in Washington and Florida.” In Beijing, Tillerson would “seek to work collaboratively to the maximum extent possible with important partners, like China.” Thornton also clarified that Tillerson’s trip would shed light on important U.S.-China initiatives that have been on ice since the presidential transition in the United States, including the talks toward a bilateral investment treaty. In South Korea, Tillerson will confer heavily on the subject of North Korea, including the country’s recent missile tests. North Korea has so far tested five ballistic missiles in 2017 and indicated that it could carry out its first-ever test of an intercontinental ballistic missile capable of reaching the continental United States later this year. 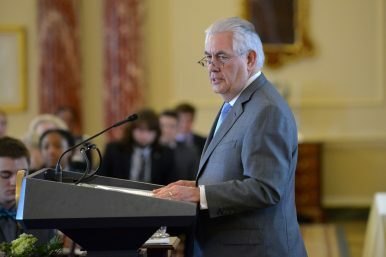 Thornton emphasized that Tillerson’s trip would show that “we are moving quickly to establish good lines of communications.” Apart from Tillerson, no other Trump administration staff affiliated with the White House will be joining the trip, as is customary for multi-country tours by secretaries of state. In a sign of growing momentum for the Trump administration’s attention toward the Asia-Pacific region, reports emerged Monday that U.S. Vice President Mike Pence would travel on a four-country tour encompassing Australia, Japan, Indonesia, and South Korea as well. In Japan, Pence will begin consultations with Japanese Deputy Prime Minister and Finance Minister Taro Aso on a potential bilateral free trade agreement between the two countries. How did Trump's first-ever presidential trip to U.S. allies Japan and South Korea go?